A Foodie Bibliophile in Wanderlust: Fractured... ABC Books? You know how there's a whole genre of books out there called "fractured fairy tales?" Where an author turns the fairy tale archetype on its head somehow? Well, I've decided to coin a new genre of picture books called "fractured ABC books." We all know the format of a traditional ABC book:each letter of the alphabet has its own page and there is something that represents each letter to go along with the theme of the book. Fractured ABC books find a way to satirize or parody this format, while still making it kid-friendly. Two books I read recently follow this "fractured" format and had me howling with laughter. Normally in an ABC book the picture and the word represented go together, as they should since ABC books are designed to help kids learn their ABCs. But Mike Lester decided to make young readers work a little bit for their ABCs. Each page has an incorrect word to go with the letter, but if you look closely, you'll see how it fits. 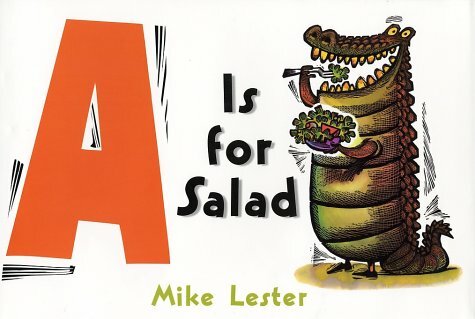 Just as on the cover, A is for Salad because there's a friendly looking ALLIGATOR eating a salad on the page. E is for pajamas because an ELEPHANT is wearing pajamas with a peanut pattern on them. If it were not for the hilarious illustrations, this book would surely fail, but Mike Lester succeeds 100% in the humor department. I'm already thinking of ways I could use this book with my 6th graders, even if it's just reading it on a day where everyone needs a good laugh. Any book that makes me snort AND laugh so hard I cry is worth reading in my opinion, but then again, maybe I'm just easily amused. 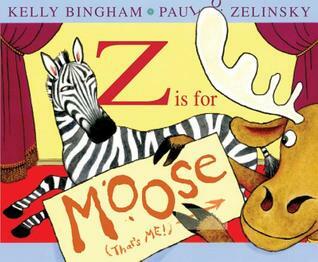 What ensues when a moose hijacks an ABC book? HILARITY! Zebra is working really hard to have all the ABC's go off without a hitch, but an overenthusiastic Moose keeps butting into the scenes at the wrong time. Anxious and excited for his turn when M comes into the story, Moose is devastated to discover that Zebra chose a mouse instead. Now that Moose has been kicked out the story altogether, there's certainly no chance that this book can end successfully... or can it? I read picture books to middle school students all the time and this became such a favorite with my sixth graders that it made it all the way to The Elite 8 of our March Book Madness championship. Just because kids grow up doesn't mean they don't want to still be kids. Give one or both of these books a try and I guarantee you, laughter will resound through the entire house or classroom, or wherever you choose to read it.